Voting for the Next Top Spiritual Author is Open to the Public Through May 3 and you may receive gifts for participating! Anyone can vote and help determine who wins the competition being conducted by New York Times bestselling author, James F. Twyman, and Robert Evans, creator of the Messenger Mini-Book Program. The winner will receive a publishing contract from Hampton Roads, along with a promotional package worth over $50,000. The 14 E-books in the Ultimate Destiny Success System Library are our gift to you when you vote for our book or any other book in the contest and when you subscribe to our free Ultimate Destinyland newsletter. Or you may order the $97 CD and pay only $7.95 S&H. There is a PDF to the right with hyperlinks to the 14 titles. This program has two powerful components! One person will win the book deal, but even if they don't, all contestants will gain valuable skills and learn what it takes to get noticed. I think this is an amazing opportunity we're offering. James Twyman. Your Vote Can Help Discover the Next Top Spiritual Author! With over 200,000 titles published each year in the U.S. alone, up-and-coming authors have a tough time being noticed by publishers. The Next Top Spiritual Author competition, brainchild of New York Times bestselling author James F. Twyman and Robert Evans, creator of the Messenger Mini-Book Program, aims to change that. The winner receives a contract from Hampton Roads Publishing, a premiere publisher of spiritual titles including the Conversations with God series by Neale Donald Walsch. The winner also gets a promotional package worth more than $50,000 and James Twyman will introduce books by three other competitors to publishers and agents in the spiritual book market. "This program has two powerful components! One person will win the book deal, but even if they don't, all contestants will gain valuable skills and learn what it takes to get noticed. I think this is an amazing opportunity we're offering. James Twyman." "We want everyone who participates to win! We've put together a powerful home study program that will help people develop the skills any publisher looks for. I hope that we help produce several bestselling authors through this program. Robert Evans"
Other experts in publishing and marketing—including Marianne Williamson, Neale Donald Walsch, and Arielle Ford will help participants in the optional home study course learn how to benefit from being in the contest. Charles Betterton, founder of the Ultimate Destiny University for Conscious Sustainable Living and coauthor of the Ultimate Destiny Success System is one of the 2,500 authors in the contest. He and his team of 8 coauthors have participated in dozens of publishing and marketing training programs over the past few years—with experts such as Mark Victor Hansen, creator of Wealthy Writers Wisdom Training Program— and Arielle Ford, creator of Everything You Need to Know About Publishing, Publicity, Promotion and Building A Platform to create their Ultimate Publishing and Marketing Resources list. “The contest has become more of a collaborative community than a contest. Hundreds of the 2,500 authors are actively supporting one another in the chat room provided for participants to share their ideas and receive advice and feedback. Charles Betterton" In fact, the primary reason I entered is to connect with other authors, to develop new strategic alliances and find more new books that we can include as featured resources in our publications, he added. Betterton’s contest entry—Crowned with the Ultimate Success of the Lord: Discover Seven Ascension Attitudes That Help You Awaken to Spirit, Realize More of Your Potential, and Know How To Co-create Your Ultimate Destiny -- is designed to help readers enjoy greater love and well-being; find inner peace and wisdom; and create more abundance, prosperity, and success in their lives. It includes self-discovery exercises, featured resources, and a number of bonuses—including several from other authors in the contest. More details are provided in the downloadable 22 page PDF. Many contestants are providing a gift for anyone who votes for them. To encourage participation in the contest, Betterton is offering a copy of his newly-published Ultimate Destiny Success System Library to anyone who subscribes to the free Ultimate Destiny University newsletter and casts a vote–for his book or for any of the other authors in the contest. An optional CDROM with all 14 titles is available for only $7.95 shipping and handling. The library includes 14 stand-alone, interactive digital programs: Manifesting Your Ultimate Destiny; Realizing Your Ultimate Potential; Fulfilling Your Life Purpose and Mission; Enjoying Financial Freedom and Prosperity; Solving Your Ultimate Destiny Success Puzzle; Harnessing Your Creative Power, Achieving Ultimate Success in Business or Career; Enjoying Loving Relationships; Raising Your Consciousness; Enjoying Ultimate Health and Well-Being; Attaining Spiritual Enlightenment; Enjoying Peace and Balance; Making a Difference and Leaving a Legacy; and Fostering Personal and Planetary Sustainability. The Ultimate Destiny Success System library is just part of a comprehensive group of more than 101 books, e-books, seminars, workshops, and webinars now in development by Betterton and the team of writers working with Ultimate Destiny University, a Sedona-based, non-profit membership organization. Their shared vision is to help millions of people A.R.K. -- Awaken to Spirit, Realize more of their potential, and Know how to co-create their Ultimate Destiny, whatever that means to each individual. “We’re happy to share our programs with anyone who votes for any author in the Next Top Spiritual Author Program and who subscribes to our free Ultimate Destiny ezine. Charles Betterton”. We already offer most of our programs on a Pay What It’s Worth To You Donation basis to provide expanded access to resources that help individuals, organizations and communities realize more of their potential. We want to give people the tools to address the economic and environmental challenges we face, and the opportunities to solve our personal, community and global ultimate destiny success puzzles, Betterton added. More details are provided in the PDF Introduction to Ultimate Destinyland. Introduction to Crowned with the Ultimate Success of the LordThis is an introduction to the web site and programs being developed based on the manuscript for the book, Crowned with the Ultimate Success of the Lord. Introduction to Ultimate Destinyland and the Ultimate Destiny Success System LibraryIntroduction to Ultimate Destinyland, the Ultimate Destiny Success System Library and ways you can participate and profit. 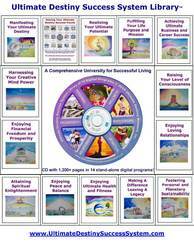 One page PDF of the Ultimate Destiny Success System Library with hyperlinks.